I defended my PhD thesis titled 'Sparse Models and Convex Optimisation for Convolutive Blind Source Separation' on 21 February, 2011. You can find an abstract of the thesis here. My thesis supervisor was Rémi Gribonval. My primary research interests include sparse models and algorithms in signal/image processing and large scale data problems, compressed sensing and blind source separation. 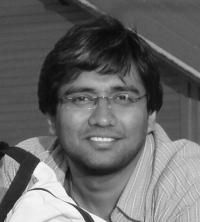 1) [T] Prasad Sudhakar, Sparse Models and Convex Optimisation for Convolutive Blind Source Separation, Ph.D. thesis, University of Rennes 1, France. 2) [T] Prasad S., Signal processing algorithms for digital image forensics, 2007, M.Sc. thesis, Indian Institute of Science, Bangalore. I completed by Bachelor of Engineering(BE) in Computer Science and Engineering from Siddaganga Inst. of Tech. , Bangalore university in 2000. I worked for a short time in Robert Bosch India Ltd., Bangalore before working in Ittiam Systems Pvt. Ltd. Later I did my M.Sc.(Engg.) from the Electrical Engineering department of Indian Institute of Science(IISc). My masters thesis was titled 'Signal Processing Algorithms for Digital Image Forensics'.